hide-n-(sensory)-seeking: A Year in the Secret Garden - Tea Party, Book Review, and $100 Amazon Gift Card Giveaway! We are a busy blog, about a busy family, with a generous dash of self-deprecating humor. Oh yeah, we talk about homeschooling, Autism, Sensory Processing Disorder, and BiPolar too. 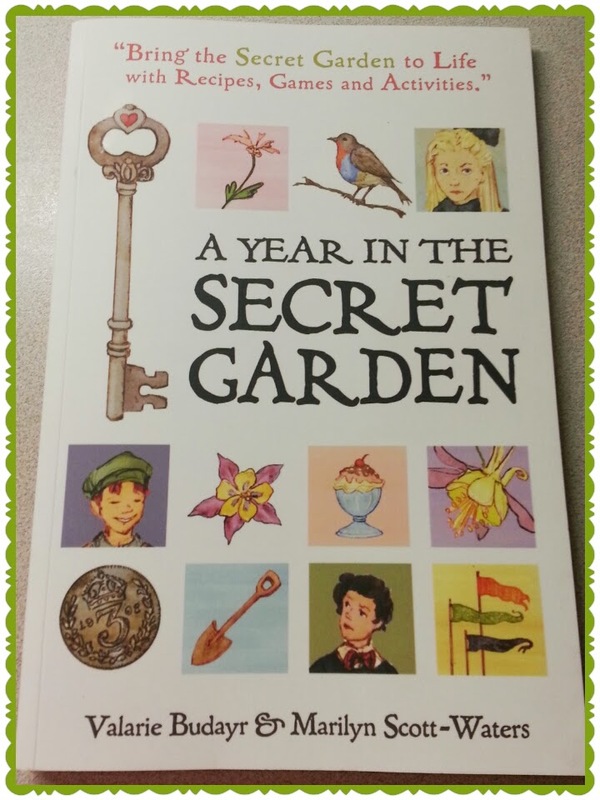 A Year in the Secret Garden - Tea Party, Book Review, and $100 Amazon Gift Card Giveaway! We are still buzzing with excitement from this weekend. Our house was transformed Saturday afternoon into a dazzling venue for our Mid-Summer Indoor Garden Tea Party in November. I recieved a beautiful paperback copy for review, but otherwise I have recieved no compensation. All thoughts and opinions of the book are entirely my own. Inspired by and written as sort of a companion and activity guide for The Secret Garden by Frances Hodgson Burnett, this book is divided into twelve month sections. 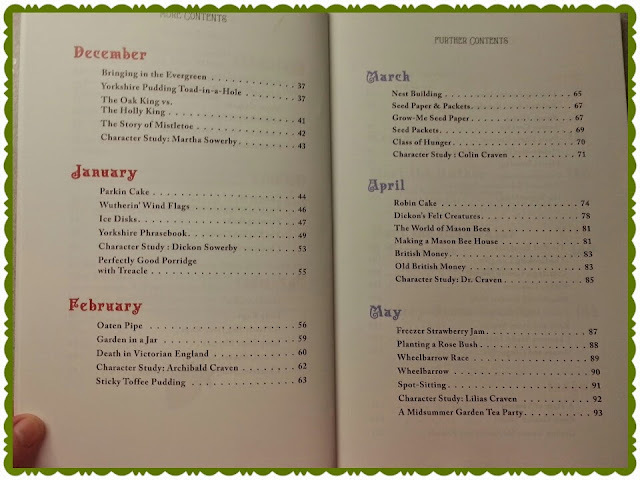 Each month highlights traditional activities, recipes, life in that era, and a character study. It is a wonderful, hands on, practical way to take kids on a journey back in time and see how children and families lived in another era. The illustrations are colorful and whimsical. The photographs are great visual aids to keep kids engaged. And the activities are fun with directions that are easy to follow. 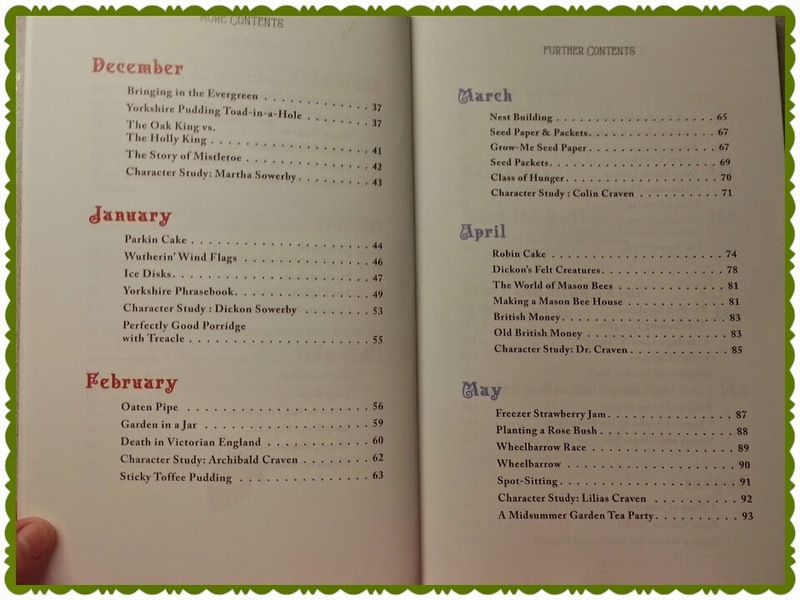 As part of the Blog Tour, I was assigned the month of June. Which meant we got to organize a Tea Party!! It has been something Grace has been wanting to do for several months now, so it was the perfect activity. The hardest part was pinning down a date. Between my schedule, and those of several we wanted to invite, and the cold spells that nipped through, it was a challenge. But we finally were able to pin down Sat. Nov. 22. Cutting it close to my deadline, for sure, but was the date that best worked. By Wednesday I decided to stop hoping for clear weather and just planned to do the party at the house. Grace and I did our shopping on Wednesday. To help get the house ready, my sister offered to take Kit off my hands for the two nights preceding party day. I gratefully accepted! So Thursday afternoon, Grace and I put together the Goodie Boxes and bags. 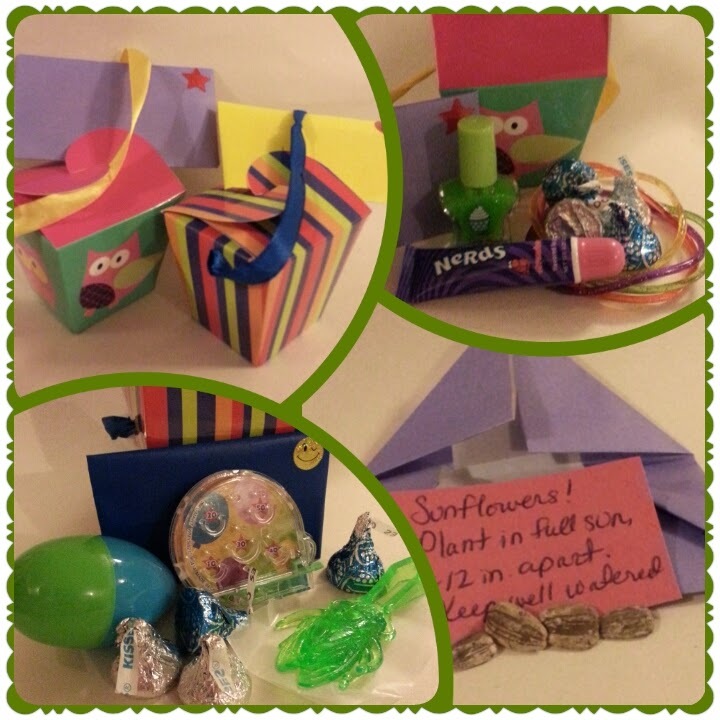 Since we invaded the boys by having our party at the house we made goodie boxes for them too! They got scented stickers and the girls got Sunflower seeds. Grace picked out the color of paper for each guest and I folded them into envelopes. The mamas (and grandmas and aunties) got a little Pampering Package. Friday morning was cleaning (otherwise known as hide all the big mess in Mom and Dad's room and quickly wipe down everything else), and Friday afternoon was cooking! One of my BFFs had offered to make the Lemon Cookies, one of the recipes from the book, and they turned out perfectly! Not only were they beautiful, but they were so delicious! Really soft and moist. I supervised while Grace made a recipe (not from this book) she has had her heart set on since I told her we were going to have the party. She did all the work, I only answered questions and helped with the mixing a tiny bit at the end. She made two, heavenly delicious Mud Pies. Everybody really liked it, but her Daddy could not get enough of this, nor could one of the other moms, who ended up taking the recipe home with her, she loved it that much. I'll be posting the recipe in a post later this week, so check back in a couple days! Grace and I also made some Jelly Tarts. 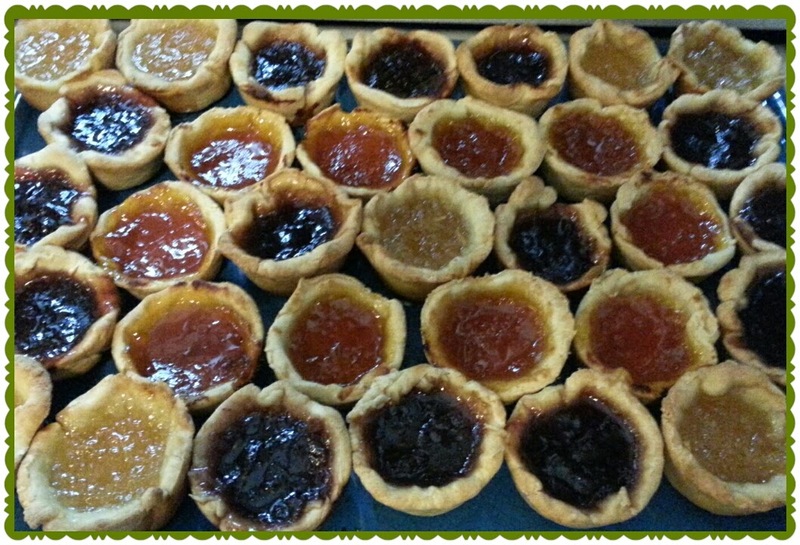 They came out very pretty, but the shells ended up being over-kneaded pie dough instead of short bread. Let's just say it was good we had tea to soak them in to soften the crusts a bit! They were fun to make though, and fit the setting perfectly. 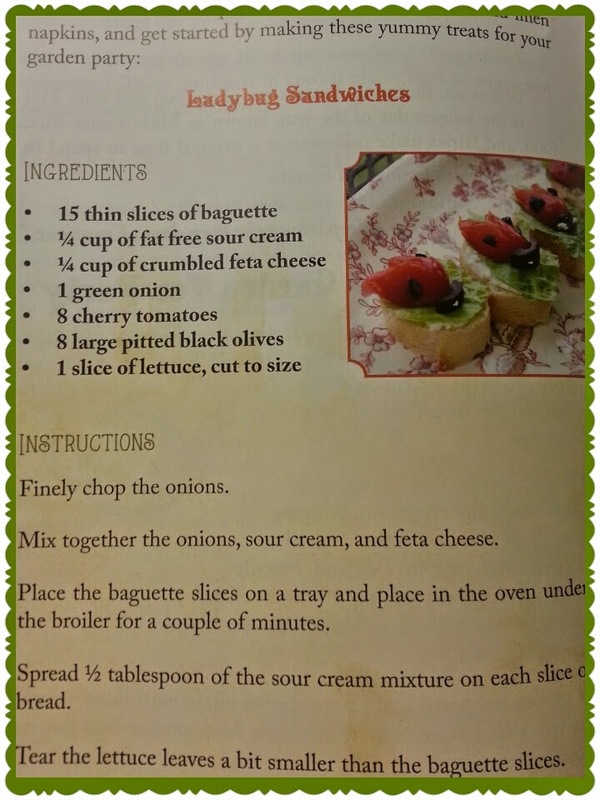 After the kids were in bed, I settled in at the kitchen table to make another recipe from the book, Ladybug Sandwiches! I took a few short cuts with the recipe, though. For example I found it easier to poke the knife into the tomato and twist a hole, rather than trying to cut out tiny pieces. And instead of cutting all the way through to separate the "wings", I just slit a straight cut down the middle, leaving the front and back in tact, but giving the visual of a separation between the wings. It made the process much faster! 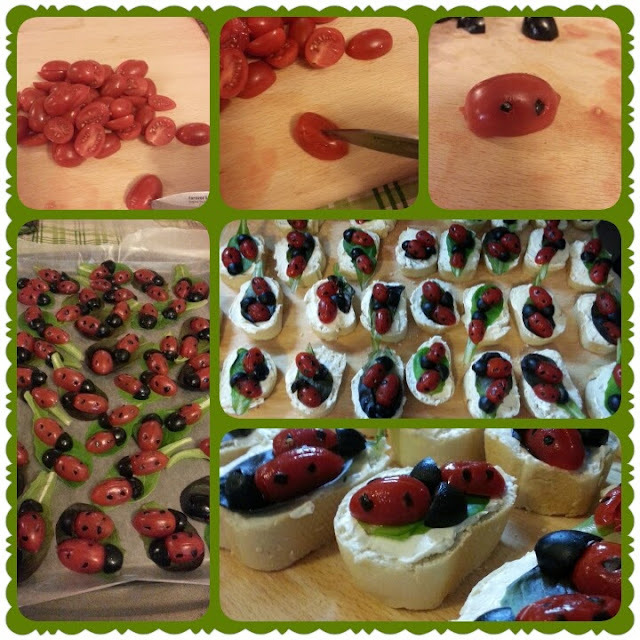 Especially, since I had to make sixty little lady bugs! 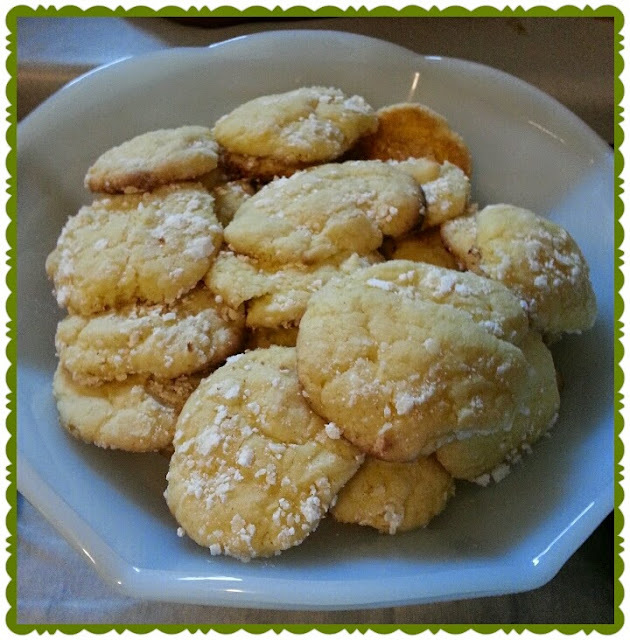 I placed them two to a leaf on wax paper on a cookie sheet, and refrigerated them overnight. The next day we Sliced the bread, spread the cream cheese spread (I also tweaked this! 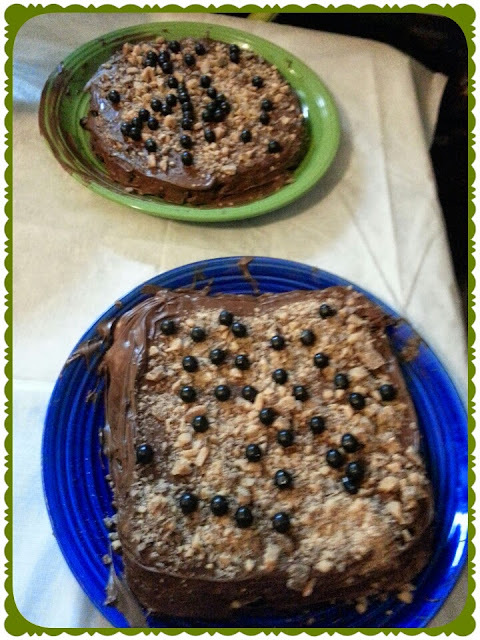 ), and then transferred the leaves with the ladybugs on them onto the slices. I knew I would have a million things to do Saturday morning, so I didn't want to be stressed when trying to make the ladybugs. Making them the night before was perfect. And they were a huge hit! My twelve year old son cooed over them the way he does when he sees a puppy, "They are so cute! They are just adorable!" That felt pretty awesome. Since it was supposed to be a Garden Tea Party, there had to be flowers! So I asked a friend and one of my sisters to both bring some, which they did. 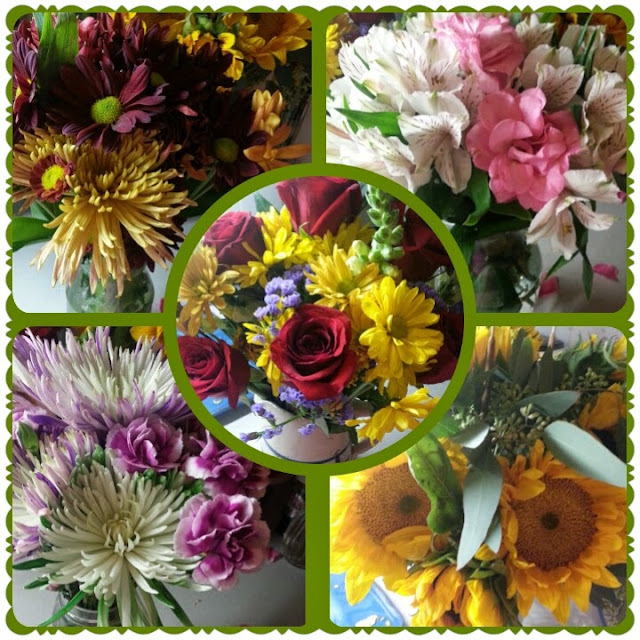 And I found some great discounted bouquets at Kroger Friday night, so we did a great job of bringing the Garden indoors! A few friends showed up early to help us get ready, and they were life savers!! They were amazing sou chefs, helped wash the dishes, arrange flowers, set the tables! But best of all they kept me sane! I didn't have to do it all myself, so I am so grateful! I finally got to use the tea set that came with the china set from my Grandparents! It is so pretty, and it was absolutely the perfect occasion! Then more friends arrived! With more food! 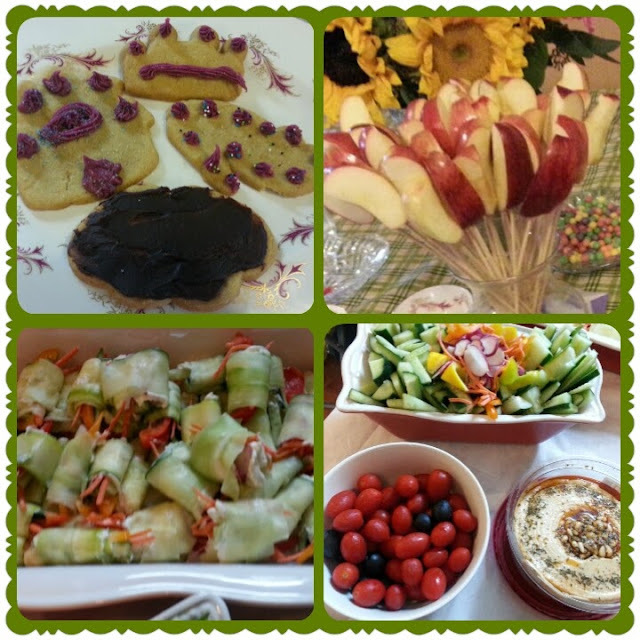 We had an amazing spread, onion pies, salad stuffed jumbo shells, cupcakes, veggie rolls, veggie dippers with hummus, salmon dip, cheddar and pimento spread, sugar cookies, Cajun cookies, lemon cookies, ladybug sandwiches, apple dippers. and of course...tea! I brewed up a peach and wild berry tea and mixed in sugar and frozen berries. It was quite delicious! I also made a vanilla chamomile blend, and a blueberry tea. But the peach and wild berry was definitely the tastiest. Most of the girls tried at least one, even the boys enjoyed it! A few of the girls decided they were happiest with plain milk. I'm sure there were plenty of girls back in Mary and Colin's time who preferred good fresh milk over tea as well! 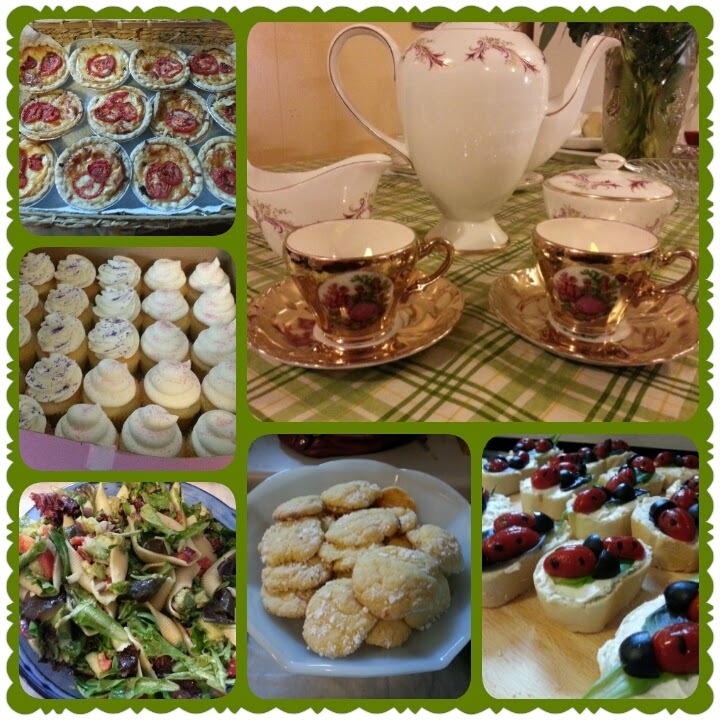 So our tea party was a smashing success! We had a grand total of 11 girls, 4 boys (they mostly played outside and popped in and out for food :), 10 ladies, one Daddy (thank you to our table fixer, taxi, and official Mud Pie taster,Victor! ), and one Grandpa! We really had a blast and it was a really fun and memorable day. Even Kitty Bitty enjoyed a spot of tea! And I am looking forward to doing so much more out of this wonderful book. Though I think we are going to start now with the corresponding month that we are actually in! This is a great book for any family with kids. As a homeschooling family though, a book like this is golden! Such amazing ways to get kids excited about literature, history, even geography! I honestly haven't found a single thing about it I don't like. Even the pages are thick, glossy and durable, also known as kid resistant and life ready! I encourage every family to add this to their home library. 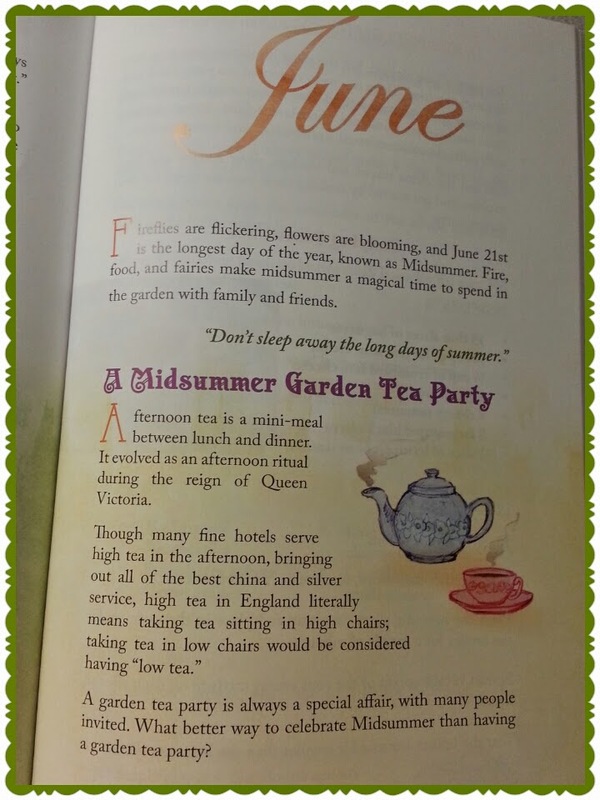 And to have a real, full blown, English Garden Tea Party (indoors or out!) at least once, but more if at all possible!! I know we will. If you want to learn even more about the book, or see what other bloggers have to say, please go visit them by clicking on the links below! 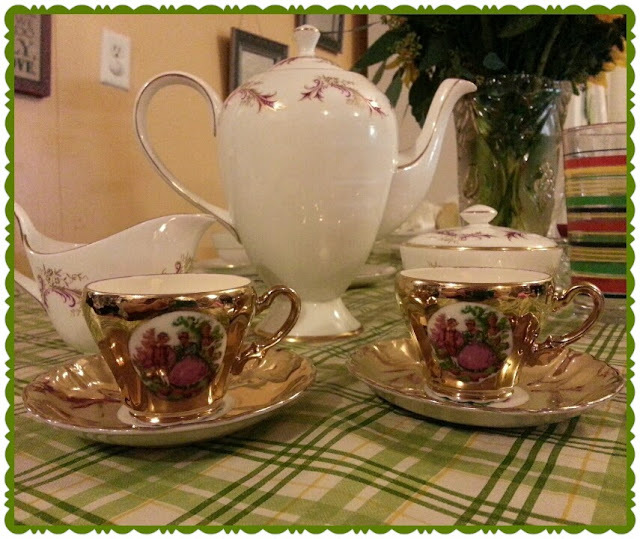 And thank you for joining us for our tea party, I hope you feel as inspired as I do! And don't forget to scroll down and enter the giveaway for a $100 Amazon Gift Card!! Linked up with Share With Me. WOW! I mean, really WOW!! You put on an entire event and can I just say that your tea set is absolutely gorgeous!? I just loved how you were able to weave in so many ideas from the book into this amazing post. 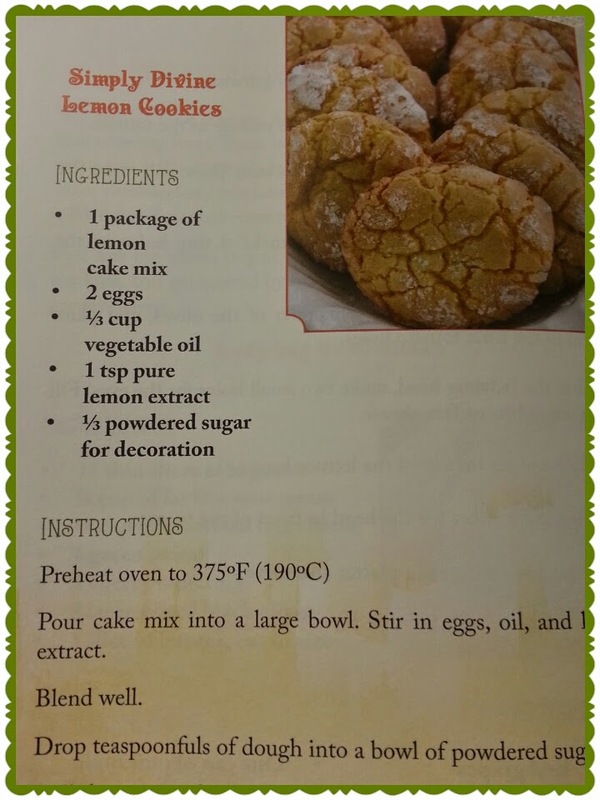 I really want to try those lemon cookies - they look delicious. I hope you all had a lovely time with your tea party. 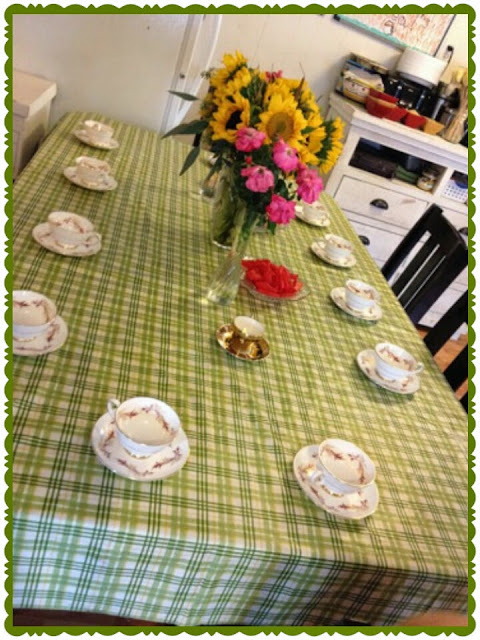 Thank you so much for sharing so much information about your "A Year in the Secret Garden"- inspired tea party and for taking part in the tour. It was truly my pleasure! We had so much fun. I'm so glad we got this opportunity. I'm glad you enjoyed it! Judith, you are simply amazing. This is exactly how our mother/daughter bookclub looked like. We'd take a book and bring it to life fully. It was this book club that has inspired our guidebooks to children's classics. It warms my heart to see what a delightful and amusing time you all had. I wish I lived closer, I would have had to stop by. 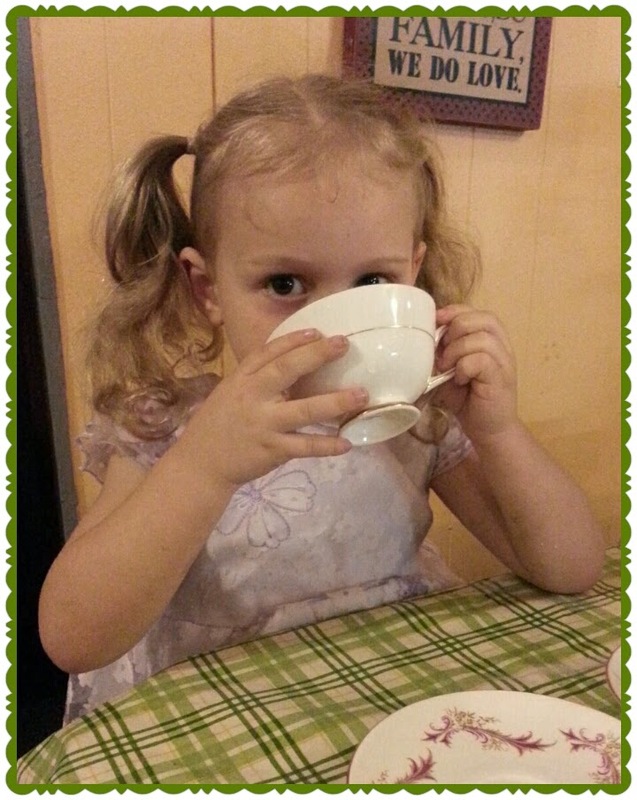 Thank you for putting your heart and soul into your Secret Garden tea party. All involved will never forget this wonderful and and this classic tale. Much thanks again and many happy moments in the Secret Garden !!! Awww...such sweet compliments! I'm so happy you like it. It was so fun, and yes, we made many memories! Thank you for coming by! What a gorgeous book and review! I don't think I have ever seen a book review with such detail and effort. You did an amazing job with an even more amazing book. Thanks for sharing! Thank you so much! This book is easy to rave about! Thank you, I love my tea set, and was so excited to go all out for this. Don't get to do it as much as I would really like to. Hi! I'm Judith. I love coffee, reading, winter, and slippers. When they all combine I am completely in my happy place! I'm a busy homeschooling Mama of three, and I love it. Lazy days are the best, but crazy days are our normal. So glad you stopped by! Fresh Brewed Week 3: When to Say Tech-No! Word of the Week: EGGS!